About a month ago, I found an amazing cedar wood chest at Goodwill. I first noticed it because it seemed like it was made out of solid wood (so rare these days). 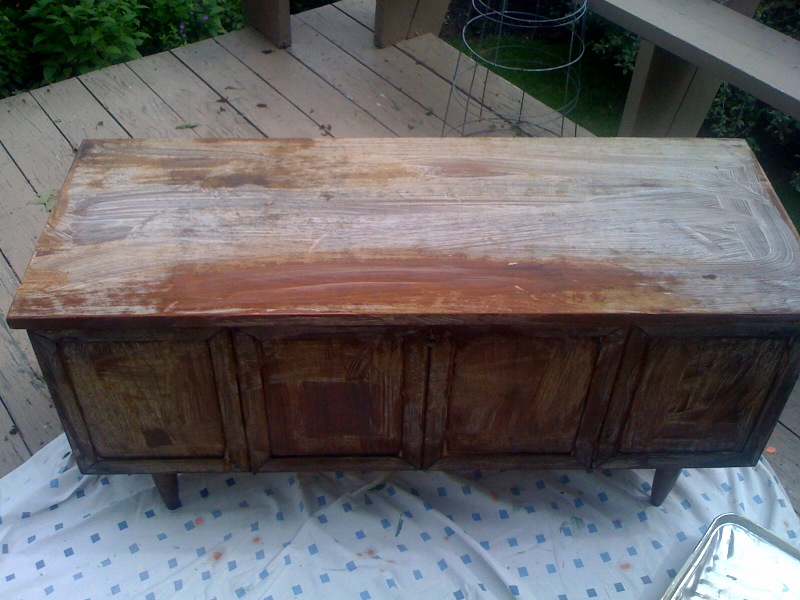 I walked up to it, lifted the top and realized I had found a fully lined cedar chest. I am always on the lookout for chests and wooden storage units – brand new cedar chests run $200 and up and many times you will find storage chests made out of cheap wood laminate. 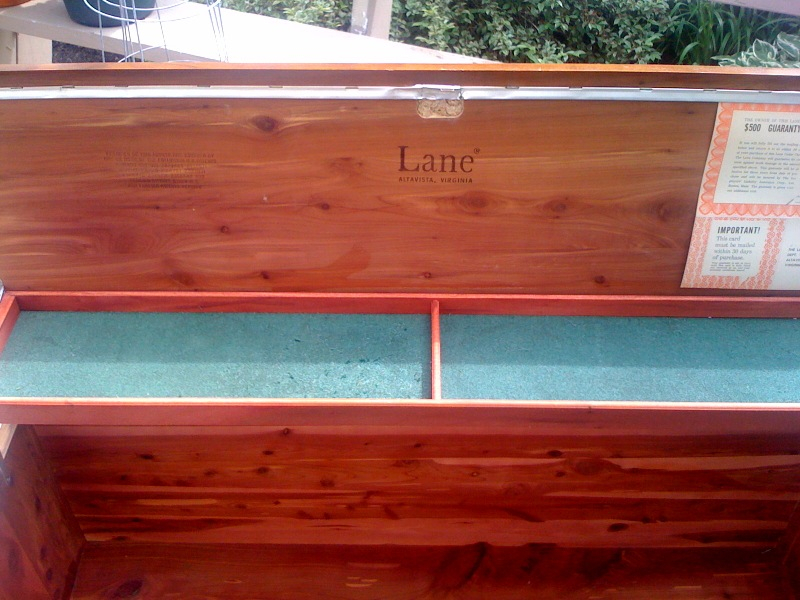 Not only that, but I had stumbled upon a Lane sweetheart chest. 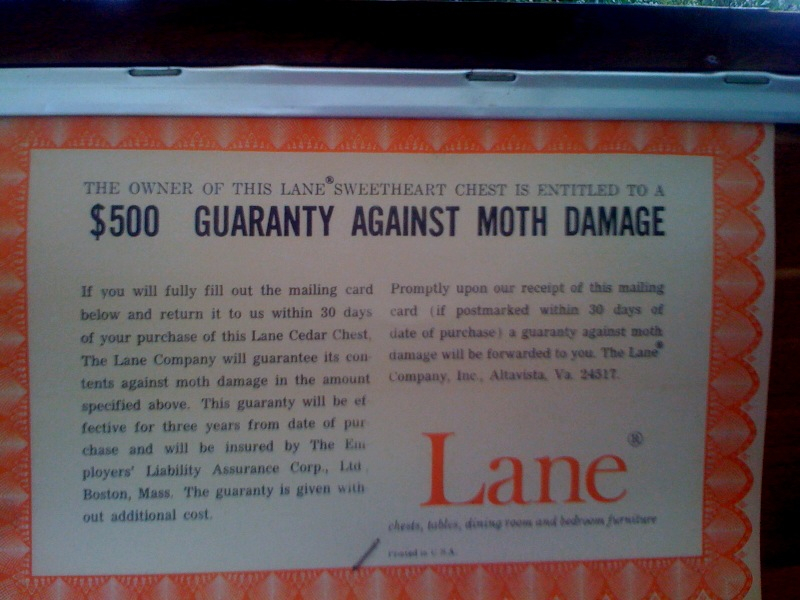 The Lane Furniture Company began making furniture in Virginia at the beginning of the twentieth century and was one of the major manufacturers in the state. According to the Virginia Historical Society, the Lane sweetheart chests were manufactured from World War I through 2001, when the last chest “rolled off the production line” and the plant permanently closed. 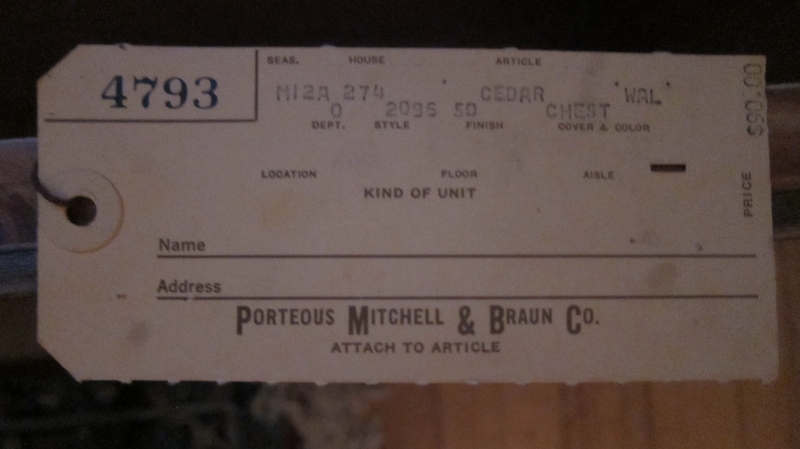 This chest was also originally sold locally at Porteous, Portland’s once thriving department store on Congress Street (which currently houses the Maine College of Art). My guess is that this chest was originally purchased sometime in the 1950s. According to the tag, this was sold for $90. Using the US Department of Labor’s inflation calculator, this is equivalent to over $840 today! A very large purchase at the time. I got the chest for $20, and as you can see, it was in pretty good shape. 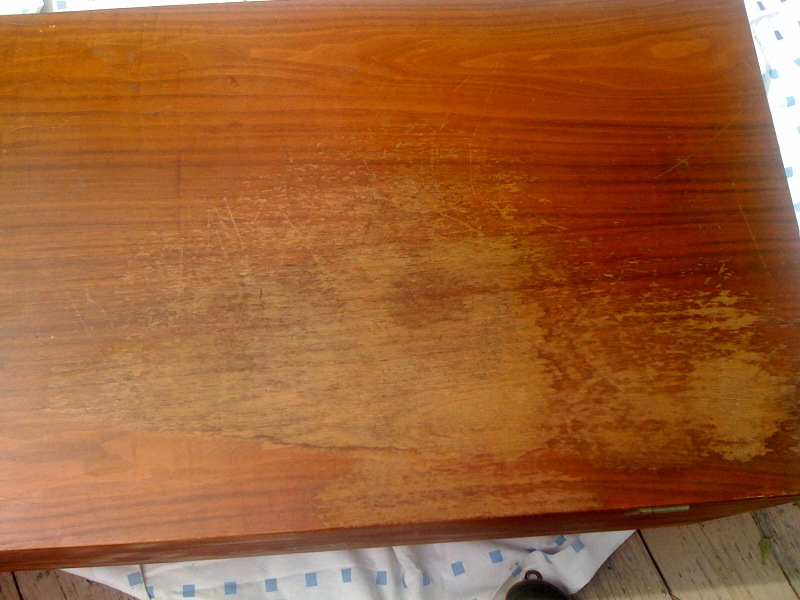 The only issue was the top of the chest – the varnish was scratched and faded. Now, I have never, ever taken part in any type of woodworking or refurbishment – but I saw this chest as a great opportunity to try it out. After doing some research, I decided to strip the old varnish on the exterior of the chest (I was not going to touch the cedar inside, it’s perfect), sand it down and re-varnish. I’ve only gotten as far as stripping and starting to sand, but here is my progress to date. First, I put on eco-friendly Citristrip Stripping Gel and let it sit for about an hour. 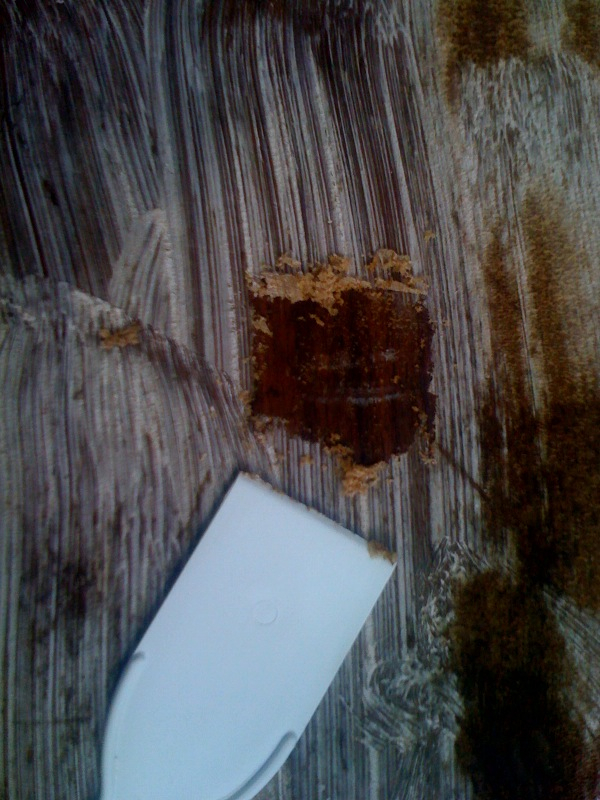 After letting it sit, I used a plastic spackling tool and gently pushed off the old varnish. 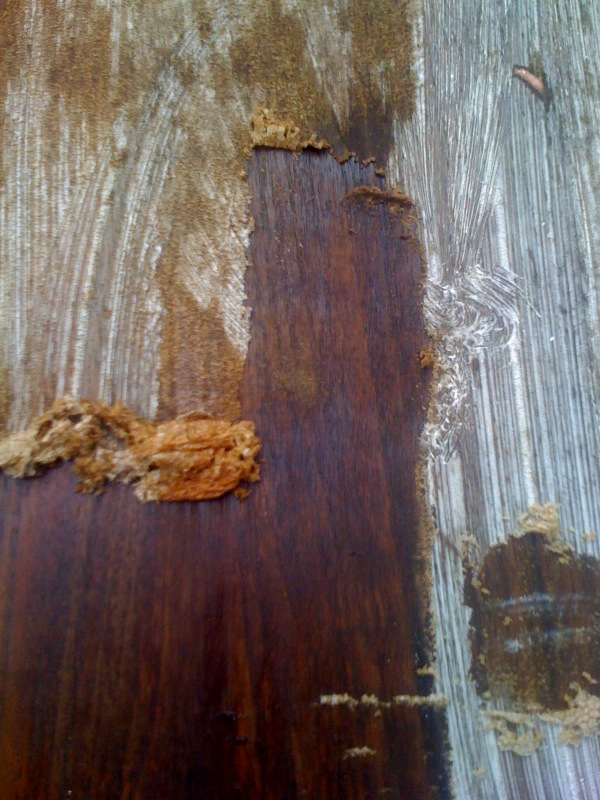 It was like magic, the old varnish came off! Most of it came off pretty easily – it was harder to strip on the corners and on the front half of the chest near the handles. Most of the damage on the top of the chest is now gone – my next step is to completely sand the exterior and choose a varnish to protect the wood. Any recommendations on color or eco-friendly varnish? 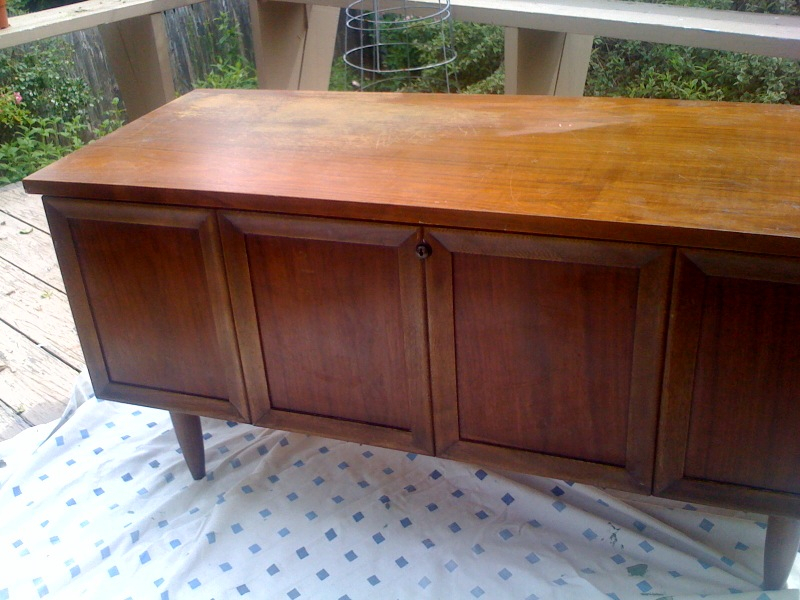 This entry was posted in Thrifting and tagged Cedar Chest, Citristrip Stripping Gel, Goodwill, Lane Furniture, Lane Sweetheart Chest, Refurbish, Thrifting. Bookmark the permalink. that chest is amazing! i’m always so jealous of everyone else’s thrift store finds. Thanks, Megan, can’t wait to see you next weekend! What a fabulous thrift-store find! I can’t wait to see what it looks like when it’s all finished. You will post pictures, right? One eco-friendly option might be to use good old fashioned Milk Paint. I comes in a ton of colors and is has a really nice finish to it. I’ve used paint from the folks at http://www.milkpaint.com with tons of success. What an awesome fine! I have always been nervous about re-finishing furniture, but you give me hope! Nice find Michelle! Can’t wait to see how it comes out. nice job michelle… like your blog! Thanks, Tom! It’s something I’ve been wanting to do for awhile! Hi Larrry – interesting, I’m not sure what you would do – I’m new to this process. My guess is that you might have to restrip and sand down the whole top again, to make sure you get rid of the original coating. Do the dark circles look really bad or do they blend it with the rest of the wood? We just found this exact same chest at our local thrift store. The top is in better condition that your find, but we are looking into preventing any additional wear. Thanks for posting this! I also am refinishing a lane cedar chest, slightly different design but still beautiful…mine was not a good wood finish on the outside so I painted mine, using a polycrylic to give it a shine, it’s water base and doesn’t turn yellow over time. Good luck with your project!! 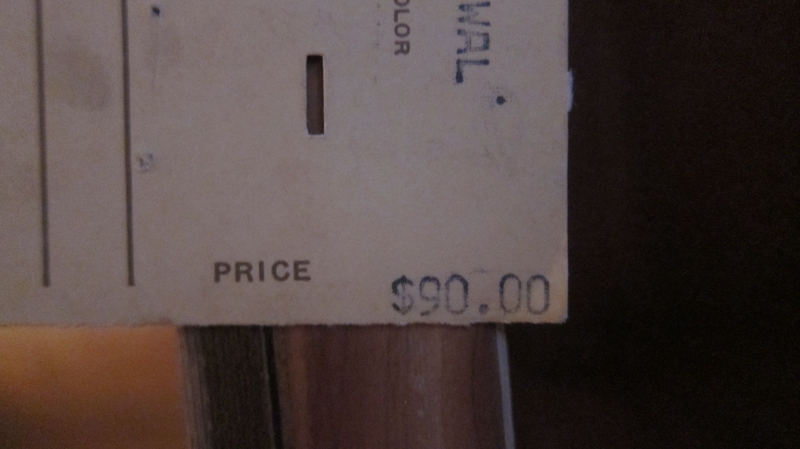 i bought a Lane cedar chest at yard sale for 5.00 just like the one you have. One of the legs is broken. I have the let I’m not sure how to fix it. I just finished the same type of chest with Formbys refinisher and tung oil. It is for my granddaughter. It is beautiful. Tresnesa… try tablelegs.com Most legs of that vintage are fitted to the bottom of the cabinet by a threaded rod or screw. If you can’t find an exact replacement then you can buy four alike and finish them like the originals. So how much is it worth today and is it considered an ANTIQUE…? A friend gave me one..it’s 1947 made very good condition and has the Original key along with the original tags inside just like this one here… so I wonder if it’s worth any money. Need to know how much a lane ceder chest is worth. It’s a 1927. Pattern No. 47580. It also states it’s a Moth=Killer. If that means anything. Awhile ago, a newspaper article mentioned that the old chests (1950) have unsafe locks. I neglected to order a lock at the time. Are they still available? 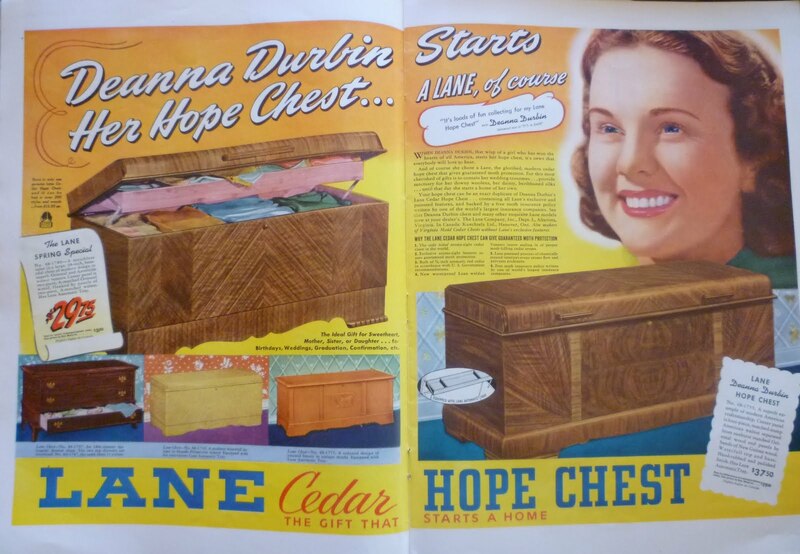 I have that actual Lane Hope chest in “mint new ” condition, taken excellent care of it. What would be the value of that chest in mint condition. I purchased it new in 1966-67. I’m stripping the same chest! It was painted black- now it’s down to bare wood. I’m thinking of staying lighter rather than the original dark red. Wish I could share a pic! !